I’m sure you’ll agree that a good motor oil must be backed by a solid reputation of the manufacturer, and carry a good quantity and weight. That was our top criteria for selecting the best motor oil. If you want to cut to the chase the Edge Extended Performance Synthetic Motor Oil by Castrol scored above the rest in every category and is our top pick for a high quality motor oil for your vehicle. These top rated motor oils are very popular with car owners everywhere thanks to their performance. There are several different kinds of oils, both energy conserving and synthetic blends, and knowing which the right one is can feel like a challenge you may not want to take on. The purpose of these top rated motor oil reviews and the detailed buyer’s guide is to provide you with the education and knowledge you need to not feel in the dark when it comes to choosing the right oil for your vehicle. It’s not as hard as it may seem. Take a look at these top rated motor oil reviews and see which one appeals to you and meets the needs of the vehicle or vehicles you’re driving. After reading these reviews and the guide you will be much more confident about your knowledge of the motor oil your vehicle uses and why. The environment changes in your engine on a regular basis. The engine oil you choose needs to be able to respond to those changes on a constant basis. The job your engine oil has is to take care of the different metal to metal contact points in the engine. All of them have different needs, pressures and temperatures. Good oil takes care of ALL of the needs without you having to even think about it. Castrol Edge Extended Performance Synthetic Motor Oil provides your vehicle with optimum performance. 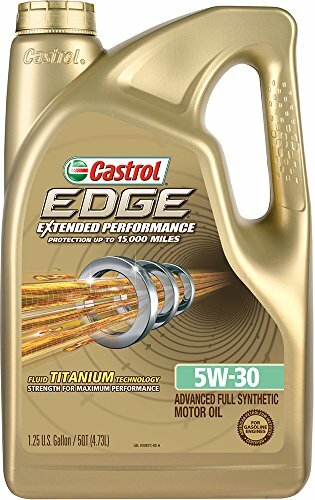 It provides car users up to 15,000 miles between oil changes..
Castrol Edge Extended Performance Synthetic Motor Oil also Exceeds ILSAC GF-5, API SN, ACEA A1/A5, ACEA B1/B5. You can be confident that this oil has the power it needs to maintain the thickness and density it requires under the force your engine puts on it. This synthetic oil weight is 5W-30 and works for all cars that can handle synthetic motor oil and that call for that particular weight. This 5w-20 High Performance Synthetic Motor Oil has proprietary additive technologies that have been mixed with premium base oils to create high performing motor oil that makes the most out of your car’s engine performance. It improves the performance of both gasoline and diesel engines and protects as well. Royal Purple High Performance Synthetic Motor Oil meets most of the warranty requirements that US passenger cars and lightweight trucks have. Although the company recommends waiting until you have had the first manufacturer’s oil change in brand new gasoline or diesel vehicles before upgrading to their oil, no special procedures are needed when you do make the switch. Car owners will experience better wear protection, increases in fuel efficiency, improved compatibility with any fuels that contain ethanol, superior corrosion protection and much more when they chose Royal Purple High Performance Synthetic Motor Oil. Royal Purple Motor Oil is safe to use regardless of the age of your vehicle. The company recommends having two short runs with the oil, one at 3,000 miles and one at 5,000 miles before extending the duration between oil changes. The benefit to doing this is that it allows Royal Purple Oil to remove any existing deposits slowly, a little at a time. Getting rid of these deposits is good for the engine because it reduces the chance of restricted engine oil flow. Rotella Full Synthetic Heavy Duty Diesel Engine Oil is the perfect oil for diesel vehicles when you need extreme protection from extreme high and low temperatures. In addition, you will notice that your engine will be a lot cleaner and the wear and tear on it will be reduced as well. This formula provides 34% better performance when it comes to wear and tear over the previous formulas. You can use this oil on many heavy duty engines, both on and off highway. It is the perfect oil to use for diesel vehicles that are fitted with DPFs, diesel particulate filters. If your vehicle is a low emission, heavy duty engine, you will see even more effectiveness from using Rotella Synthetic Heavy Duty Engine Oil. With a weight of 5w-40, your vehicle will have a thickness rating of 5 in cold temperatures which means it will start easier since the oil will flow easier. At normal operating temperatures the viscosity will be 40 which is a bit thicker. Make sure that your vehicle’s operating manual states that this is the right weight of oil to use. 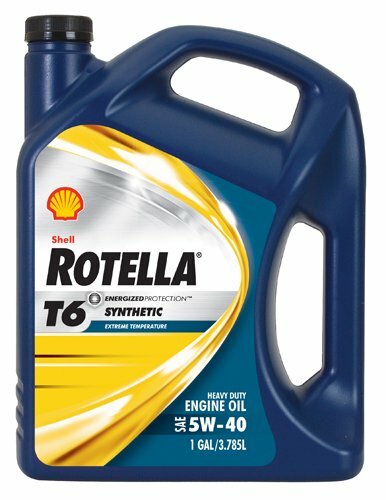 If you have a heavy duty diesel vehicle, you will definitely want to try this oil from Rotella. With all of the benefits it provides, your vehicle will be around and in good working condition much longer. Choosing the right motor oil for your vehicle is a crucial element is how it runs performs and even how long the engine lasts. These top rated motor oils are designed to get the best performance it can from your vehicle by helping it run smoother, run cleaner and last longer. There are a lot of different brands of motor oil on the market today and deciding which one is the right one can feel overwhelming, especially if you don’t know a lot about vehicles. We have provided a buyer’s guide below with even more information about the importance of choosing the right motor oil and how to choose the one that is perfect for your vehicle. With this information, our goal is to eliminate the potential stress and confusion and to help you make that decision that will be the most beneficial for you and your car, truck or van. What is a Motor Oil? Depending on the age of your car, you may have a choice between synthetic and standard motor oil for your car. A lot of the newer cars are designed to use synthetic motor oil, but if you have an older vehicle, you may still be able to decide whether you would rather use standard or synthetic. We’ll go over the different factors that come into play when it comes to making that decision so you will have all of the information you need to make the best choice for your particular vehicle. Regular oil, or standard oil as it is called, is made from crude oil through refining processes that will take out or separate the unwanted elements from the crude oil. After it has gone through this process, there will be a type of oil left that can be used for many different lubricating jobs. Engineers started looking for alternatives to standard motor oil in the 1930s. These searches led the engineers to prepare esters, including polyesters, banana oil and diesters. The first to use synthetic oil was the aviation industry during WWII in the 40s. It was not used in cars until the middle of the 1960s. At that time blends of synthetic oils and minerals were introduced and in 1974 Mobil 1 was introduced, changing things significantly. The components that synthetic oil is made from include chemically modified petroleum and other raw materials as well. If you’ve ever seen a bottle of oil in the store, chances are you will see SAE or a combination of letters and numbers such as 5w-30 or something similar. These letters and numbers are a viscosity grading that has been given based on the amount of heat, friction and pressure that the oil can maintain a solid state under. The first number indicates the vehicle from the starting position and the second number represents the vehicle at normal operating temperatures. Using our example above oil with a weight of 5w-30 would have a viscosity or thickness of 5 upon starting, which means it will flow easier, and at standard operating temps, it would have a thickness level of 30. The higher the viscosity number is the thicker the oil is. In general, oil will thin as it heats up and thicken as the temperatures drop. It is not a good idea to mix thinner oil with a hot engine. This will cause more wear and tear on the engine. On the flip side, a thickness level that is too low can be dangerous for the engine. If the oil is too thick during cold temperatures especially, it can make the engine harder to start and also take longer to get the parts lubricated properly. There are many benefits to using synthetic motor oil as opposed to standard motor oil. These benefits have caused it to rise to the forefront in the automotive industry. Synthetic oil has been shown to perform much better than standard oil in many ways. There are some circumstances in which standard motor oil is a better choice and we’ll tell you what those are. Some applications, such as some types of airplanes, use both. For the aircraft jet engines, synthetic oil has to be used, and aircraft piston engines can use either one safely and efficiently. Economic – When using synthetic motor oil, you will find that the oil needs to be changed less often that when using standard motor oil. When using standard motor oil, the schedule for oil changes is typically every 3000 miles. But synthetic oil is designed to last longer and it does, requiring oil changes only every 5000-7000 miles. This adds up to a savings in auto maintenance. Automotive – Since the lubrication of the engine is better served with synthetic oil, it improves the gas mileage and maximizes horsepower as well so your vehicle runs longer, smoother and cooler. The reason the gas mileage is better is because there is less friction inside the engine. The increased horsepower will also help the vehicle use less gas as well. Other great automotive benefits to using synthetic oil is there is less oil sludge issues, it has a resistance to oxidation and thermal breakdown, it has less thickness breakdown and overall just runs better. You will definitely notice a difference in cold weather because a car will start easier that is using synthetic oil. Environment – Neither of the oils is better than the other when it comes to the environment because both are obtained from petroleum based materials. It does have an indirect impact on the environment when it comes to the improper disposal of oil after DIY-ers change their own oil. Not everyone realizes that there is a specific way that old automobile oil should be disposed of and that is not in the sewers, trash or dumped out in nature somewhere. To dispose of your old motor oil properly, take it to an oil change facility that will accept used motor oil, or to a household waste recycling facility. Always be certain to call first to make sure they accept used motor oil. If you have a recycling facility hear you, this is an excellent way to help the environment because they make use of the used motor oil by cleaning it and turning it into fuel oil. It can be converted gallon for gallon. In other words, 1 gallon of used oil with provide one gallon of fuel oil. Used motor oil can come from cars, trucks, motorcycles, boats, tractors, and lawn mowers. Synthetic motor oil can cost 2 or 3 times more than standard motor oil. This can be a deterrent to people, but not a big one in light of the fact that there is more time between oil changes which will offset the cost increase. Synthetic oil can cause potential stress cracking of any of the plastic components that are made from polyoxymethylene or POM when it is alongside PAO. Another potential issue can be gummy deposits on the seals of the combustion chamber due to the burned synthetic oil. This is a problem among vehicles that have rotary engines and is why they are not recommended for use in those types of vehicles. How to Decide Which Oil to Use? Even though synthetic motor oil tends to outweigh standard in many ways, it is not always the right choice for your vehicle. If your car has excessive miles on it, standard oil would be a better choice. In addition brand new engines need to be broken in properly before having synthetic oil used. A good break in period is to have at least one or two regular oil changes before switching to a synthetic. You may find that synthetic oil is used in high performance engines quite often due to the right engine tolerance, high compression and operating temperatures. The good thing to know is that unless the vehicle operation manual specifies one type of motor oil over the other, car owners can use both synthetic and standard oils without problems and the two kinds of oils can be mixed as well. As far as oil filters go, they will work equally well with either synthetic OR standard oil. It will depend on the vehicle as to which motor oil is the better choice for your particular vehicle. If the car is new or if it has more than 120,000 miles, you will want to stick with standard motor oil. You can pretty much count on using synthetic for all other situations and vehicles since it helps the car start easier in cold weather, gives the engine better lubrication and provides better breakdown of the oil’s viscosity. The top rated motor oils reviewed here are all synthetic and are all customer favorites due to their performance. They will all be excellent choices for your vehicle as long as they don’t fall into the two categories we have mentioned above. With the information you have learned in this buyer’s guide and the reviews, you have the necessary knowledge to choose the best oil for your vehicle and actually know what is being out into your car. You can even request synthetic in the circumstances where you actually have a choice. Your vehicle will perform better and you will appreciate the longer lasting engine and less frequent oil changes to boot.